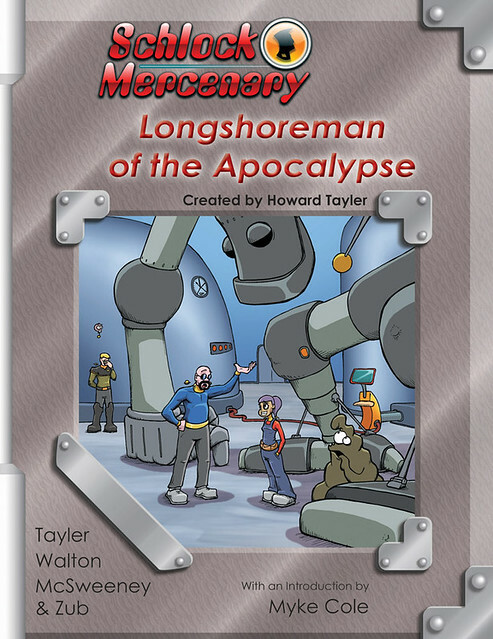 In today’s Big Idea, Howard Tayler, the brains behind the multiply-Hugo nominated Schlock Mercenary Web comic, tells you how the little things — the really little things — mean a lot for his latest graphic novel compilation, Longshoreman of the Apocalypse. The big idea? That was collateral damage, struck by a stray shell as I walked round after round toward the moment I wanted to hit. See, for somebody to be playing with artillery indoors, something has to already have gone very wrong. The alternatives to using the artillery need to be worse. And more than that, there needs to be some complexity to the problem, something that will justify far more than just the preventative abuse of ballistic rounds. Have you ever considered just how fortunate we are that nuclear weapons are phenomenally difficult to build? The key materials are rare, and the equipment required to work with those materials is expensive, and when all of the other complications are factored in, it’s far more likely for the back-yard nuclear engineer to die of radiation poisoning than to create anything more potent than a very toxic hand-warmer. But what if something with nuclear yield was easy to build? What if you could carry it around and it wouldn’t make you sick? What if you could carry it around and nobody could tell you had it, and you could set it off by pulling a pin? The Schlock Mercenary universe is an energy-rich place. “Annie Plants” convert teency pellets of neutronium into energy (via some black-box handwavium that I introduced back when I sloppier), but those devices are so heavy, and so full of fail-safes, that they don’t fit the bill. Schlockiverse engineers can, however, create and contain antimatter, one atomic nuclei at a time, inside carbon fullerene buckyballs. And if I let them do that, my story has some ultra-fine black dust in it, a teaspoon of which can level a city. Schlock Mercenary is, at its heart, comedy. And I suppose it says something about me that when I go looking for a funny story, I arrive at multi-megaton yields being juggled by non-engineers who want to protest the way their clunky, stupid government is handling the food shortage. Longshoreman of the Apocalypse: The Schlock Mercenary store. Orders between now and June 3rd will signed. Read the story. Visit the author’s site. Follow him on Twitter. Must. Buy. Must. Read. Schlock. This is probably my third-favorite Schlock story, after “Massively Parallel” and the end of book 9 (wherein Schlock assassineats* Colonel DeHaans). Oh, man. It turns into a OMFGHSWAGTD-class Charlie Foxtrot in something like 10 pages. *no typo. Yes, it was disgusting. Yes, it was glorious. 1) The ending of this story is just phenomenal. Both on the big, grand, apocalyptic scale, and on the small, personal side. Honestly, it’s the personal side of it that really got to me, I think. 2) There is a single, almost throw-away, strip in the middle of the story that involved Ventura and Kevyn talking about the effectiveness of a simulation. My day job is as a simulation engineer. This strip pretty much summed up what I do for a living. It’s printed out and hanging on my office wall right now. Handwavium. Heh, is that the element needed to catalyze kryptonite into unobtanium. This looks totally awesome. Adding to my book queue immediately. Handwavium is my favorite element. Schlock Mercenary has been a must read for me for years. And LOTA is the best storyline in a universe that has consistently been amusing and a joy to browse. I re-read LOTA last night, and it still holds up. It’s some great storytelling. I’m very behind on my Schlockiverse books; I will need to correct this! Schlock Mercenary was the second webcomic I ever discovered, back in early 2002 (Sluggy Freelance was the first). I have always been impressed by Howard’s work, and watching both his art and storytelling evolve has been a great experience. I’ve preordered every book in the series and will probably do so for the foreseeable future. What I’m saying is, I like it. And I think almost anyone who likes Scalzi’s stuff would like Howard’s too. My favorite storyline, as I’m a sucker for huge epic epicness, is Resident Mad Scientist, but LOTA is easily my second favorite. I’ve been waiting for this one to come out in book form, but I’m not going to order it — I’m going to wait until I can catch Mr. Tayler at a convention so I can get him to draw in my copy. Rapture! This is my favorite of the Schlock Mercenary stories, though Massively Parallel is pretty close. LOTA is just so amazing. If your friends are suggesting that you check out Schlock Mercenary, listen to them for a change.